The family of Ann Coverstone, of Sidney, recently gathered to celebrate her 90th birthday. During the event, a five-generation photo was taken with her son, grandson, great-grandson and great-great-grandchildren. Shown are, left to right, great-grandson Ryan Coverstone, of Sidney, with his children and her great-great-grandchildren, Gavin and Mackenzie Coverstone, her son, Bob Coverstone, of Sidney, and her grandson, Chad Coverstone, of Sidney. https://www.sidneydailynews.com/wp-content/uploads/sites/47/2018/08/web1_Coverstone5generations-copy.jpgThe family of Ann Coverstone, of Sidney, recently gathered to celebrate her 90th birthday. During the event, a five-generation photo was taken with her son, grandson, great-grandson and great-great-grandchildren. 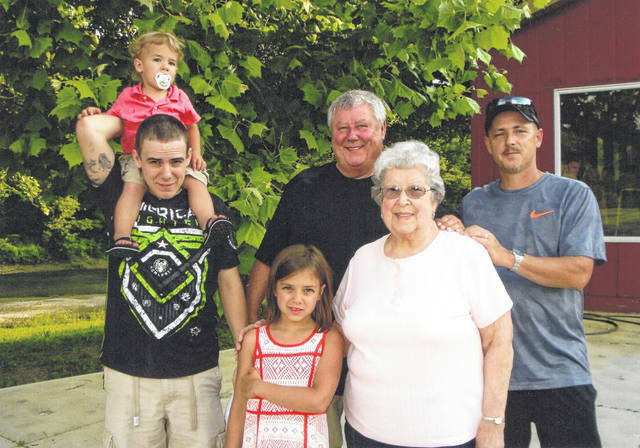 Shown are, left to right, great-grandson Ryan Coverstone, of Sidney, with his children and her great-great-grandchildren, Gavin and Mackenzie Coverstone, her son, Bob Coverstone, of Sidney, and her grandson, Chad Coverstone, of Sidney.